Here we are on the last day of the hop and the response has been overwhelming! If your favorite sets are out of stock, don't worry more are on their way. 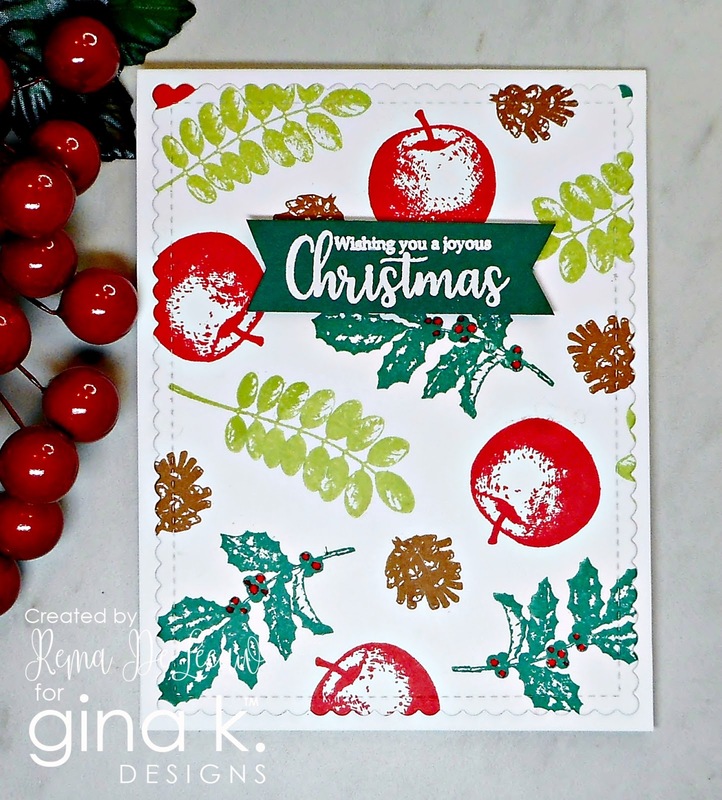 Today we are focusing on the new StampTV Kit Fruit of the Season. 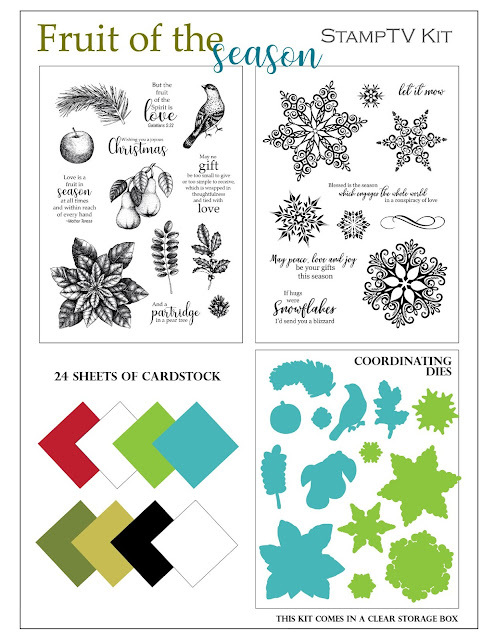 It includes 2 full sized stamp sets, coordinating dies and 24 sheets of assorted colored card stock. This definitely is a beautiful must have kit and worth the price! 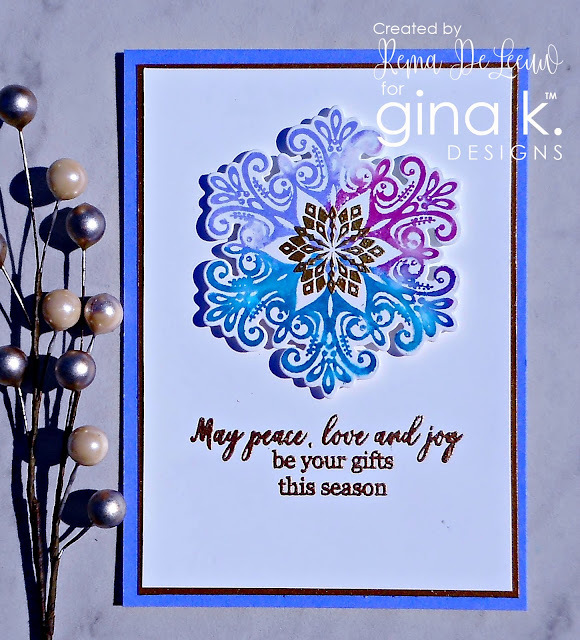 Before I share the projects I have created with this amazing kit, I want to remind you that there are three $50 gift certificates up for grabs to Gina K. Designs. Just leave a comment on all the blogs all three days to be entered. The winners will be picked randomly and announced in the Big News Forum at StampTV a few days after the hop. ﻿Ready for some inspiration? Here are a few of the cards I created featuring this kit. I lightly spritzed a few areas on the snowflake with water to give it a washed out look. 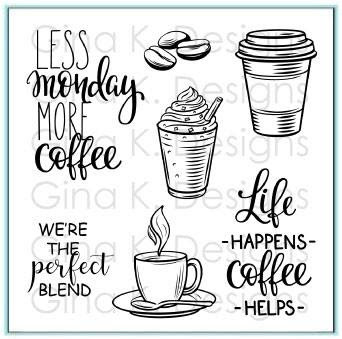 I have one more card to share with you featuring this month's mini incentive stamp set Perfect Blend free with a $75 purchase. No code necessary, the set will be automatically added to your order. I created the coffee stain by inking the bottom of my coffee cup and stamping it directly onto my card panel. 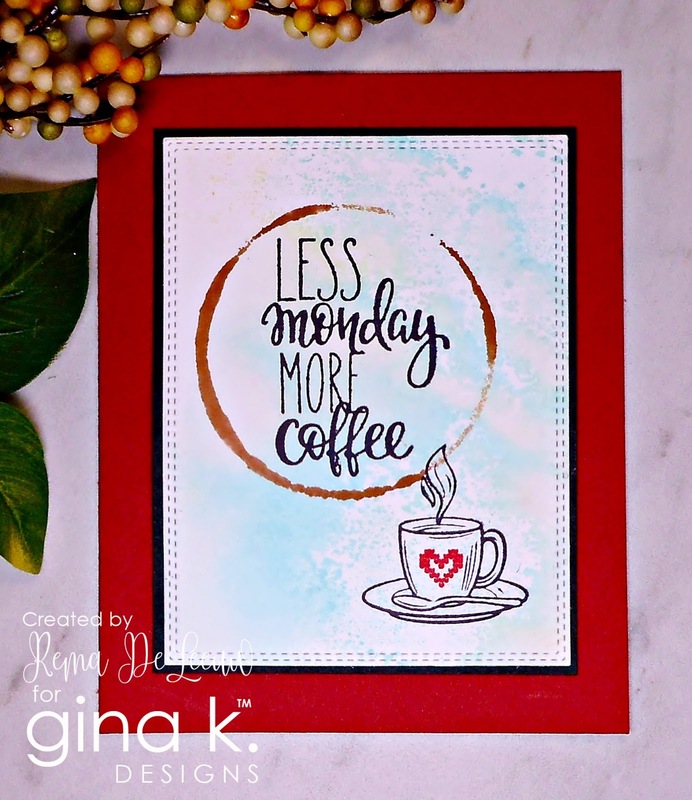 Click on the links below to see more inspiration from Gina and the team! Your next stop on the hop is Sheri Gilson ! Your holiday card are outstanding and that coffee stain card is delightful. Lovely cards. Love the coffee stain! Beautiful cards, thanks for the wonderful inspiration!! Another fun set of cards. Thank you. Beautiful cards, thanks for the wonderful inspiration!! Fun designs! Great cards! Especially enjoyed the coffee stain card! I'm amazed at all the color choices! The blues are gorgeous! Wow! Love the colors! And the coffee stain! Great ideas! Thanks for sharing! Great cards. Your snowflake is gorgeous. I love how you created the coffee stain. Love all that you created! Love your color combinations, beautiful cards! 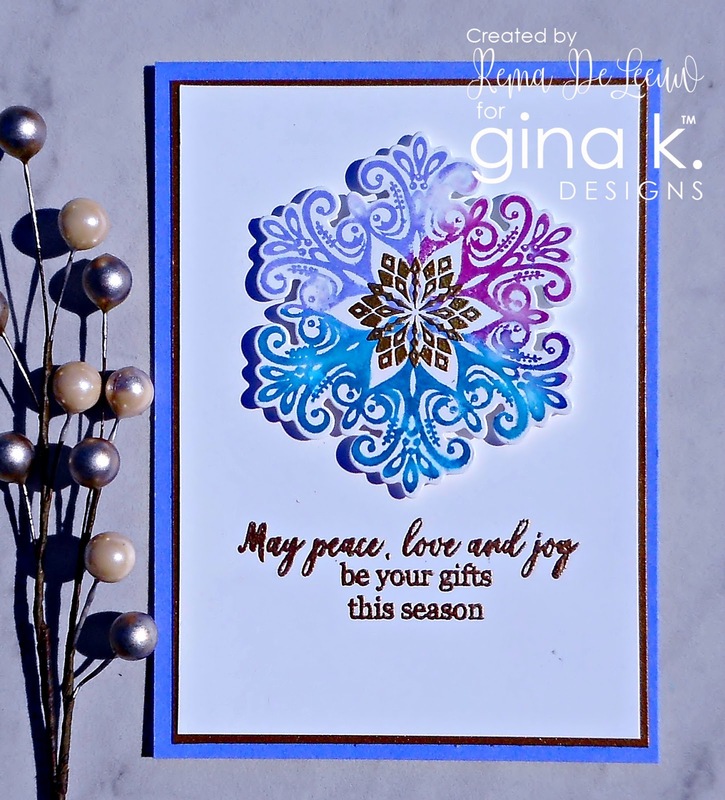 Your first snowflake card really has a wow factor. I love the vibrancy. Great cards, very inspirational! Thanks for sharing. Awesome kit and awesome cards...Love your creativity!! Such inspiration!! Awesome inspiration. Your cards are all so lovely. I love a stamped all over design like your 3rd card is. Beautiful cards. I love this snowflakes in this kit, and your card using that set is gorgeous. Cards are gorgeous, especially love the coffee one!! I just love the color that you used on the first card, the snowflake is so unique and the coffee stain is so clever! Love the bright colors! Pretty cards. Pretty cards - thank for sharing your inspiration. I love, love, love your multicolor background!!!!! Wonderful cards! Great cards! Had to look at the first one twice! Very cool. I love the vivid bright colors you used! GORGEOUS! Rema, I love your 1st card posted. All of your cards are beautiful. Thank you for sharing. Incredibly beautiful card display. 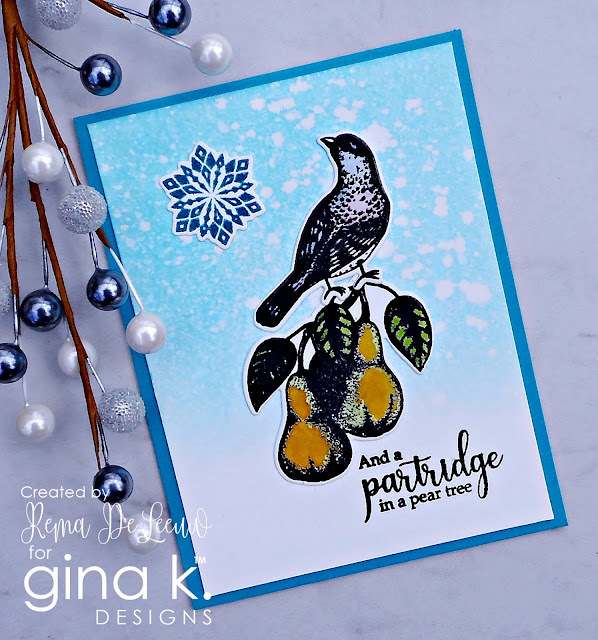 The snowflake and partridge cards are so cool, blue is absolutely my favorite color and those to cards reinforces my opinion. Thanks so much for sharing and inspiring. Lovely cards! The different colored snowflake is great! Thanks for the inspiration. Beautiful cards!!! I love the color combination on the large snowflake. Great cards. Thanks for sharing!!!! All of your creations are done with much creative talent. The snowflake card is the one that caught my eye the most. Wonderful cards and I love all the stamps in the set. I also love the way you used the coffee theme set too. Lovely cards and color choices. Your coffee card was so cute I had to go get myself a cup. All of your cards are exceptional. Found myself loving your color and stamp choices on your Wishing you a Joyous Christmas card. It had a very happy vibe to it! Wonderful cards and great sentiments. Lovely cards! Thanks for the inspiration! Such creative designs and vivid bright colours to showcase these stamps! Very pretty and the color combinations are cool. Love all the bright colors ! Lovely cards. I like your backgrounds! Beautiful cards! Thanks for sharing! Love the blues and the coffee stain. Beautiful cards! I love the vibrancy you bring to your creations - fantastic! Love Everything especially the snowflakes! Love your cards. Thank you for sharing. this is such a great new kit and love how you've used it to inspire us! Lovely cards, Rema. Great color combinations. You have created some beautiful cards. The snowflake is my fav. These cards are all so pretty! I love all of the new sets. can't decide which ones to get, cause I want them all. I love the backgrounds you did on every single card! Gorgeous! Beautiful cards; thanks for the inspiration! What good ideas you have. I liked all of your cards.